A SUMMARY of this report is [HERE]. The Mills Canyon area is a mixture of low elevation grass and shrub lands and shrub steppe with ponderosa pine and Douglas-fir at higher elevations. Soils in the burned area are relatively dry in Xeric moisture regime and range from warm to cold in the Mesic, Frigid, and Cryic soil temperature regimes. Soil Map Units 29 and 30 are the dominant soils with a “High” burn severity rating in the Mills Canyon Fire. Together, they make up the steep slopes of Ardenmont coarse sandy loam soil series. They occur on mountain hillsides of weathered schist bedrock that generally have a northerly aspect. These deep, well-drained soils are coarse sandy loams (residuum and colluvium) derived mainly from schist mixed with minor amounts of volcanic ash and loess in the upper part; high amounts of gravel appear below 4 inches deep, appropriate for Hydrologic Soil Group B. The metamorphic Swakane geologic formation dominates all but some lower elevations in northeast portions of the burned area. Foliated schist and gneiss and intrusive granodiorite underlie steep, dissected mountain slopes, also called the Chelan Tephra Hills subsection. Soil Burn Severity Mapping was conducted from July 25 to July 28. Validation of the Burned Area Reflective Classification (BARC) occurred from ground visits to predetermined locations from July 26 to July 27. The ground visits confirmed or adjusted spatial boundaries. BARC values were validated or adjusted based on pre-identified site locations for BARC values of low, moderate, and high. 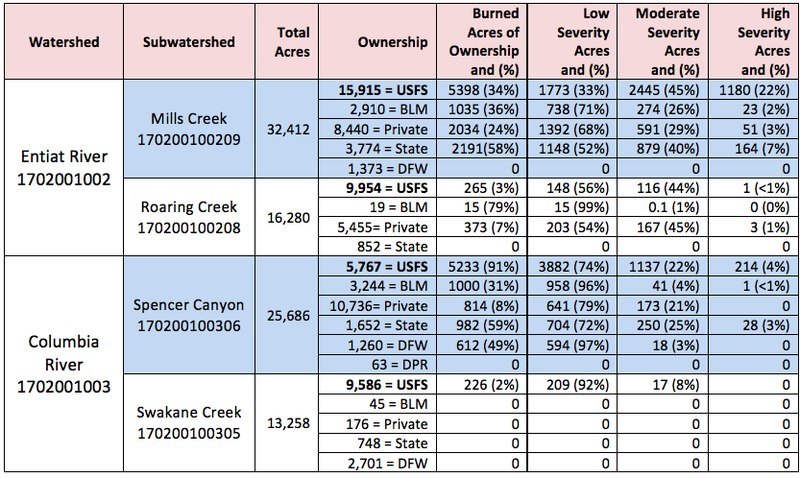 Once finalized, the BARC mapping showed predominantly low burn severity, but 85 percent of the High Burn Severity and 69 percent of the Moderate Burn Severity occurred within the Mills Creek subwatershed, primarily in the steep upper reaches. There is potential for accelerated erosion from the effects of the fire. Modeling shows a potential for an increase of 16-65 times pre-fire erosion rates. The increased erodible soil can result in downstream sediment, which can bulk flows and cause increased flooding impacts. The loss of soil can impair soil productivity in the short-term and potentially long-term future. 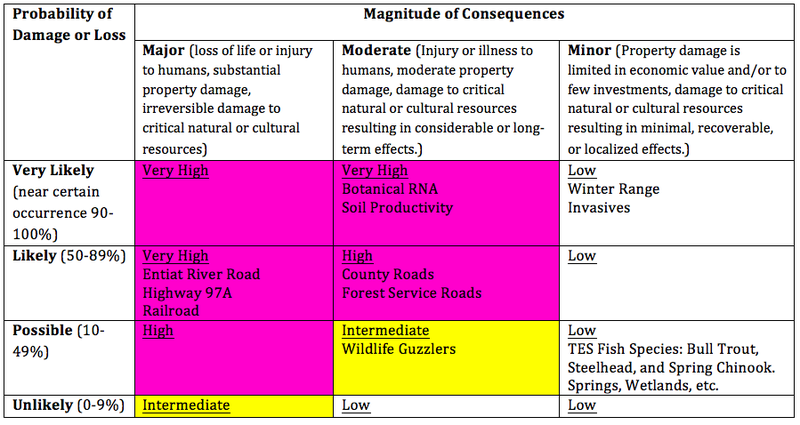 After identifying the potential Values-at-risk (VAR), the BAER team evaluated the predicted post-fire effects using the risk matrix outlined in Forest Service Manual 2500 Watershed and Air Management, Chapter 2520 Watershed Protection and Management, 2523.1 Exhibit 02 – BAER Risk Assessment. The team’s evaluation is noted in the table below. Threats to life, safety, and property exist in valley bottom areas and in steep burned gulches throughout and downsream from the burned area. Residents and road users will be exposed to increased risk of flooding and debris flow. Houses and other structures, driveways, other private property, Forest Service roads in valley bottoms adjacent to or in the floodprone areas or near stream channels are at increased risk for flooding and debris flow. In several locations, the roads intersect the steep disected canyons and are at increased risk of damage from debris flows. The Mills Canyon Fire can be separated into two categories from a transportation system: a) maintenance level 1 roads that run mid-slope off the main collector system and have been closed at the beginning of the road with physical barriers; b) steep maintenance level 2 roads that dissect the watershed connecting the Mills Canyon and Dinkelman Canyon floodplains with the surrounding ridgelines or upper watershed features. Both canyons have a history of debris flow or sediment movement as a result of naturally occurring events and post-fire events. Treatments were identified for each of the primary routes within the fire perimeter: Forest Service Road (FSR) 5200, FSR 5210, FSR 5212, FSR 5213, FSR 5213-120, FSR 5213-125, and FSR 5215. 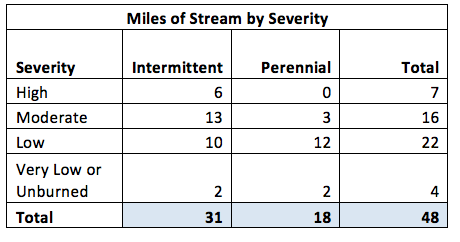 Based on the BAER team’s risk-rating exercise, the matrix identified that it was important, given a likelihood of damage occurring to the road system and a moderate risk associated with those impacts (rating of HIGH), to concentrate on providing one primary access route, i.e. FSR 5200, and to reduce the impacts to and from FSR 5212, which has the highest probability of damage because of its proximity to the high severity burn areas. Treatments for the other roads will be provided in the appendix and to local engineers for use if monitoring indicates that interim funding should be requested. The primary watershed responses of the Mills Canyon Fire area are expected to include: 1) an initial flush of ash, 2) rill and gully erosion in drainages and on steep slopes within the burned area, and 3) flash floods with increased peak flows and sediment deposition. The watershed responses are expected to be dependent on the occurrence of storm and melt events, and greatest with initial storm events. The disturbances will become less evident as vegetation is reestablished, providing ground cover and increasing surface roughness. However, the nature of the watersheds within the burn area makes them susceptible to large runoff events. Potential post-fire effects to the Entiat Watershed include increased water temperature, peak flows and channel scour, surface erosion and sediment delivery, and landslides and debris flows. These post-fire effects may affect the survival of ESA-listed fish eggs, fry, juveniles, and adults downstream of the fire. They may also alter habitat and channel conditions. Because of the proximity of steep drainages within the fire area (Mills Canyon, Dinkelman Canyon, Roaring Creek) the potential for detrimental impacts to listed fish habitat is high. Four noxious weeds are documented within the vicinity of the sensitive plant populations: Dalmatian toadflax (WA State Class B), spotted and diffuse knapweed (WA State Class B), and cheatgrass. Dalmatian toadflax spreads through seeds and rhizomes; each plant can produce a half-million seeds. The seeds are small, about the size of poppy seeds, and are easily spread through the air as the flower stem is blown in the wind. Diffuse and spotted knapweeds and cheatgrass spread through seeds that maintain viability for at least 10 years. High soil burn severity in the burned area occurs on steep slopes that have lost nearly all canopy cover and have ground cover consisting largely of rock fragments and sparse remnants of grass or small plants. These soil conditions result in increased magnitude and frequency of damaging debris flows. Ardenmont soils have a “High potential for damage” from fire. There is a relatively high erosion factor (Kw) of 0.32 to 0.24. The forest floor is covered with a 3 cm layer of needles and twigs from tree species managed for Douglas-fir, grand fir, western larch, and ponderosa pine over many fine roots and fungal mycelia. Much of the Mills Canyon area was previously burned by Dinkelman Fire in 1988 and the Swakane Fire in 2010. Post-fire events from both fires included substantial debris flows. There is a long history of jammer logging prior to the Dinkelman Fire. Much of the soil resource has already been subject to high erosion rates with loss of A-horizon. Landslides have occurred in the past on the steep slopes of the Ardenmont soils, e.g. one on a north-facing slope south of Mills Canyon, and another in the headwaters of Spencer Canyon. Discussions with the forest archaeologists indicate that there are limited heritage resources within the fire perimeter and no emergency mitigation treatments are needed at this time. It is critical to treat new weed sprouts and seedlings before they have a chance to produce seeds and establish new populations that would reduce Thompson’s clover, long-sepal globemallow, and mountain ladies slipper habitat and directly compete with these rare plants. These treatments will provide some level of confidence that administrative and potential public access would have a single useable road for ingress and egress, providing a factor of safety with reduced travel time in case of an emergency. A Forest Service BAER team was was assembled to conduct the burned area assesment and the BAER process of evaluating burned area conditions, critical values at risk, threats, risk and treatments. 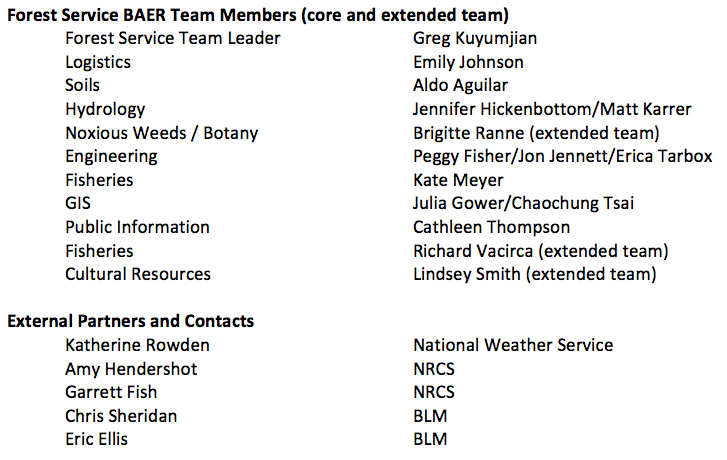 Because the fire burned both NFS and non-federal lands, interdisciplinary and interagency coordination occurred throughout the process. External partners and their agencies are listed below. Treatment #L1 – Weed treatment – Treat new weed seedlings and sprouts within the mapped populations of Sensitive plants. Treatments would be spot spraying with picloram, as covered in the Forest-wide Weed EA, or hand grubbing if required to prevent accidental spray of Sensitive plants. Timing: April 2015. Treatment #L2 – Weed EDRR – Treat invasive plants within or adjacent to Sensitive plant populations and the Thompson’s Clover RNA. Target moderate burned areas and areas adjacent to known infestations. Timing: September/October 2014. Treatment #R1a – Construct/Improve Armored Drainage Sag: Construct outsloped drain sags with armoring for diverting and removing water from the road surface and draining any roadway ditch. Typical drainage sags are 30-50 ft in length and create a low water trough to redirect drainage flow. Drainage sags are installed in natural grade breaks in the road prism. Actual spacing of drainage sags will be based on Forest Service Handbook direction and location of topographical features, particularly in areas where active streams are crossing the road. Treatment #R1b – Construct/Improve Unarmored Drainage Sag: Construct outsloped drain sags for diverting and removing water from the road surface and draining any roadway ditch. Typical drainage sags are 30-50 ft in length and create a low water trough to redirect drainage flow. Drainage sags are installed in natural grade breaks in the road prism. Actual spacing of drainage sags will be based on Forest Service Handbook direction and location of topographical features, particularly in areas where active streams are crossing the road. Construct/Improve drain dips: Construct drain dips to enable maintenance level 1 roads to better handle expected increases in surface runoff. Drain dips are recommended because of the steepness of the road prism, which renders water bars ineffective. Actual spacing of drain dips will be based on Forest Service Handbook direction. Remove Existing Culverts: Remove existing culvert and associated road fill in selected channel or draw locations to reestablish more natural flow pattern and reduce the risk of culvert plugging caused by increased sedimentation loading from the upslope fires. Removed road fill will be used to construct a drain dip down-gradient of the crossing to prevent the risk of further sedimentation from the road. Treatment #R5 – Fabricate and install gate: Fabricate/purchase and install closure gates and burned area hazard notification signs to inform the public of post-fire conditions and management actions to protect public safety (roads, trails, and trailheads). Gates will allow the Forest Service to provide essential access to private lands and protect the public from potential road washouts as a least-cost alternative. A gate is to be located at both the valley bottom and ridgeline access points for FS Road 5210 and 5213. An additional gate is needed at the FS Road 5215 and FS Road 5200 junction. Treatment #R6 –Surface Water Management: Clean inlets and outlets of existing relief culverts and those culverts in active stream channels to reduce the buildup of sedimentation that may lead to fill failure along road grades >2% within or directly downslope or downgrade of moderate to high intensity burn areas contiguous with critical fisheries habitat. Treatment includes installation of temporary erosion control during construction. Treatment #R7 – Storm Patrol: Patrol area during and immediately after storm events to repair, unplug, or aid in drainage of road drainage features along FS Road 5200 to reduce the risk of catastrophic road drainage failure and high sedimentation yield. As the remaining open access for administration and the public, it is important to monitor this road. Recommend two-person teams to complete the assessment. Days include 5 days for road crew backhoe for emergency mitigation action. Treatment #PS1 – Closure and Warning Signs: Fire closure bulletin boards will be installed at the entrance to Mills Canyon off county road 19 along with two other locations at the ridgeline to be determined by the district. Warning signs will include rock fall hazard signs at the lower section of FSR 5200 and will be installed to meet Manual of Uniform Traffic Control Devices (MUTCD) standards. Treatment #PS2 – ALERT Support: Support installation of two ALERT stations (through EWP) within the fire perimeter, with needed site surveys for appropriate clearances and preparation of a special use permit. Project will be coordinated with local NRCS and Chelan County. Questions or comments on this report? CONTACT US.